Upon arriving, a quick stroll around the market already showed us there had been some big changes since our last visit a couple of years ago. Trade in tea furniture such as tables with in-built trays carved out of a single piece of wood, and red wood furniture, seem to have grown massively, taking over the top two floors of the market. One thing that hasn’t changed is the fantastic range of shops selling leaves on the ground floor and the growing collection of teaware merchants on the first floor. Among these is my favourite teashop where I get most of my supply of blue and dark teas. Tian Ran Dao, or “Nature Island”, is a small shop in one corner of the front courtyard, just by the entrance into the mall, run by Yuan GuangFa and his wife, Zhang YanJun. Whenever we visit, the 20m x 5m shop is never empty, but always bubbling with a gentle current of activity, staff packaging leaves or replenishing the wooden trays in the middle of the floor displaying their most popular teas. There’s always at least one group of guests drinking and chatting to the hosts, who sit behind two fully-equipped tea tables, one next to the freezers, and one by the far wall displaying luxury brands. Drinkers and sommeliers associate Chinese tea with spirituality, elegance and experiences of the sublime, but like other old Chinese trades, the tea trade requires a lot of blood, sweat and probably tears. For those who work in plantations it often means long hours in hot weather and spending their lives in isolated areas deep in the mountains. For the merchants in cities, it’s not a lot better. After tasting the raw Wulong, our host Yuan deftly rinses his set and takes the sample of our choice of roasted Tie Guanyin (Iron Goddess) from the assistant. 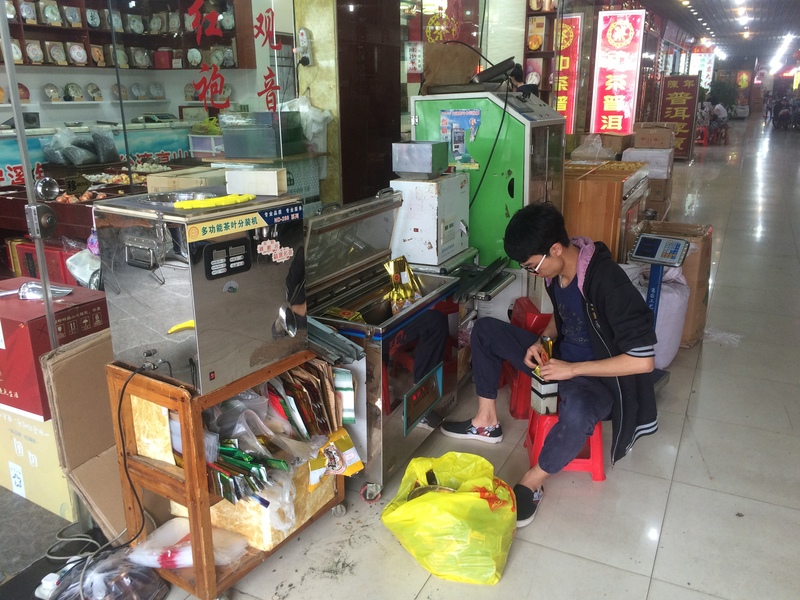 While we wait for the small kettle on the side to boil again, Yuan tells us that Tian Ran Dao is a family business that he and his wife had inherited from his parents. His family came to Guangzhou from Fujian, the cradle of Chinese tea that produces five out of the six major categories of leaves, and the dialect of which gave tea its English name at the busy ports in the region. When we first visited the couple’s shop in 2009, our conversation was intercepted by interludes of infant cries and baby handling. Now, a spritely eight year old runs around the shop, energetic though well-behaved enough not to bump into the customers. “So are you here on business or holiday?” asks Yuan, performing a paired down version of the ceremony without looking, as if the movements were second nature. I answer, a mixture of both. “We’re open all year round, no weekend breaks or holidays, except for a few days during Spring Festival. We can take days off in turn, but it wouldn’t be as fun going on holiday without my wife”. I seem to detect a hint of impatience in Yuan’s voice. “But it’s all for the next generation”. He looks over and confiscates his son’s Nintendo DS. “Just five more minutes, please?” the boy pleaded. “Alright, five more minutes and then you fun um gao” (Cantonese for to take midday rest). Yuan gets into his stride as he starts to talk about tea. Although the method of preparation determines the taste of the leaves, their quality is to a large extent, pre-determined by the cultivar, time of year during which they are harvested, the climate and soil composition. For green tea, there are two annual pickings; for Wulong, five, including one during Da Shu, the height of summer. Spring and Autumn pickings are considered better quality. Pu’er cakes combine larger leaves with small ones, Yuan tells us, breaking off some leaves from the giant compressed disc with a tea pin, while passing around a scenting plate of loose Pu’er so we could to take in the intense, earthy fragrance. Whereas those sold loose tend to be finer. Raw Tie Guanyin is just dried, whereas the cooked type is baked. Most WuLong is 50% baked, if they were totally baked, mused Yuan, they would be yit hei, contain too much hot Qi, for drinking in the subtropics. There is one type of WuLong that is 80% baked, and that’s the DanChong, which, due to its bitter flavour, is considered an acquired taste, only for those with a strong palate, says Yuan, like the inhabitants of the region where it’s grown, in Chaozhou (Teochew). I loved the golden liquid of this tea and the initial bitterness that makes the sweet aftertaste seem so much sweeter. Probably a lot more to do with having been brought up drinking WuLong, herbal teas and eating bitter gourd, than anything innately connected to my half Teochew origins. Our stay at the shop tends to be at least half an hour, as conversations flow, tea is poured generously and drunk at the natural pauses, stimulating further talk. Our host, ever considerate, never fails to warn us against getting “tea drunk”, offering us sweets or sending the assistant out to purchase a packet of fruit-flavoured wavers to line our stomachs. As the staff vacuum-pack up our cooked Tie Guanyin, loose Pu’Er and DanChong leaves, Yuan provides a helpful tip on “waking” cooked WuLong leaves that have been stored for a while, “give them a very quick stir in a heated wok, that will bring out the flavours again”. The little boy, who had resisted solicitations to take his afternoon nap, is now being called by his friends to go out and play. Just as he runs out of the shop, he pauses, walks back to the table, and gingerly lifts the teapot that had been filled full and waiting for him. Rather like French children being brought up with a glass of wine at mealtimes, so tea is a natural part of this child’s life. “We hope he’ll take over the business one day”, says Yuan as the boy drains the last cup before running out to ride his bicycle. “But it’s his choice, whether he wants to or not”. Things have changed, at least for some, from the days when parents dictated their children’s careers, as they were once wont to do in certain trades. Perhaps the business will pass on to one of the bored-looking youngsters milling around the shop tasked with packing. Later, we browsed tea ware on the first floor, where I was delighted to find a new shop selling statues of Lu Yu, the Sage of Tea, along with their sets. Another new store offering rustic designs, takes its name from He He, the Chinese gods of harmony and friendship. 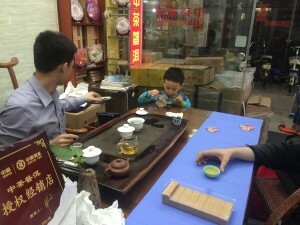 It’s clear that contemporary aesthetics of tea drinking in China is re-connecting with its ancient roots. Vintage style enamel mugs with revolutionary art have also appeared on the market to satisfy the demand for nostalgia and Maostalgia that have extended to tea drinking. The way of Chinese tea is still alive and evolving, and I hope that the lives of tea merchants, who bring this wondrous drink to us from the plantations, will also become more compatible with the today’s mores and lifestyles.